Here at dealchecker, we are waiting with bated breath for the 17th December to see if Hans Solo will still be the charismatically tongue-in-cheek hero we once grew to love, and whether newcomers John Boyega and Daisy Ridley’s characters are set to be a force for good or bad. In case you’ve been sitting under a rock for the last six months, that’s the release date for Star Wars: The Force Awakens, the latest in the series and it’s fair to say that we are very, very excited. Whilst the films are set in a galaxy far, far away, they are actually filmed right here on earth, so you can re-enact your favourite scenes in these otherworldy locations. With ever changing sand dunes, expansive salt pans and dramatic canyons, America’s hottest and driest spot, Death Valley provided the backdrop for the Tatooine desert. Episode IV: A New Hope sees a number of characters searching for Ben Kenobi’s hut in this arid landscape, whilst in Episode VI: Return of the Jedi it is the backdrop for R2-D2 and C-3PO’s visit to Jabba the Hutt. We’re not surprised that the ethereal landscape of Guilin, with its dramatic limestone peaks and mirror-like lakes, was chosen to be the setting for the Wookiee land of Kashyyyk in Episode III: Return of the Sith. In fact, we’re even left a little jealous of these hairy creatures who get to live in such gorgeous surroundings. 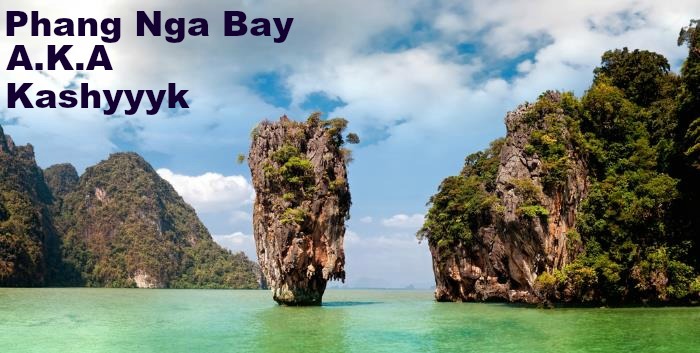 Phang Nga Bay in Southern Thailand also makes a cameo as the planet of Kashyyyk in Episode III: Return of the Sith – we think it’s those lush green surroundings and natural towers in the sea that give the place such a hyper-real quality. Our very own Whippendell Woods just outside of Watford was home to one of our favourite Star Wars moments – in Episode I: The Phantom Menace when Jar Jar Binks bounds on to the screen for his first encounter with Obi-Wan Kenobi and Qui-Gon Jinn it is in these very woods. Of course, in the film this is not England but instead the Forest of Naboo. The Villa del Balbianello, which perches atop Lake Como, provided the gorgeous backdrop for the wedding of Padmé and Anakin in Episode II: Attack of the Clones. With pretty vines and dramatic vistas over the lake, it is an eviable spot for a wedding. In the film this clandestine partnership takes place in the Naboo Lake Country. The corridors upon which Padmé and Obi-Wan fight for their lives in the Battle of Naboo (Episode I: The Phantom Menace) are actually the corridors of the Palace of Caserta just outside of Naples. With grand marble interiors adorned with great artwork, it is a building regal enough to be a royal palace, and has in fact been used as the location for the Vatican in numerous other films. The snowy mountainscape of Grindelwald in Switzerland becomes Princess Leia’s home when she is adopted by Bail Organa and his wife during Episode III: Revenge of the Sith. This is on the planet of Alderaan which is one of the only planets shown from space to look similar to Earth, inhabited by a people who have an affinity to the natural landscape. Matmata in Tunisia features in both Episode IV: A New Hope and Episode II: Attack of the Clones, and is the home of Luke Skywalker whilst he lives with his Aunt and Uncle. The Berber-style villages and expanses of desert provide a dramatic backdrop – shone on by the two suns of Tatooine. The Krafla Volcano and the surrounding areas in Iceland feature in Star Wars:The Force Awakens although we don’t yet know what the landscape will be home to. The location is certainly inspiring, with an active volcano, which in its midst features a crater which filled with a vivid green lake. It is not hard to imagine that you are on another planet in surroundings like these. Skellig Michael, a tiny island off the coast of Ireland is set to play host to some of the scenes in the newest of the Star Wars franchise. The island is home to puffins, and this is what it is most well known for, but with jagged rocks, and crashing seas it would be a great location for some dramatic cinematic moments.